November 13, 2012, Tokyo - Fuji Heavy Industries Ltd. (FHI), the maker of Subaru automobiles, today announced the release of the all-new Subaru Forester which goes on sale today. The fourth generation Forester was developed with the goal to maximize its value as a true SUV. 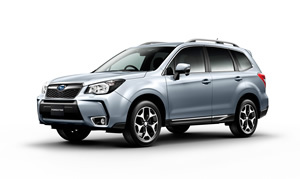 The all-new Forester enhances basic vehicle performance such as driving, safety and environmental friendliness and features Subaru' s unique Symmetrical AWD (All-Wheel Drive) system at its core. In addition to that, the Forester' s user-friendly utilities and fun-to-drive characteristic with stress-free driving were further improved. Since its launch in 1997, the Forester has been acclaimed world-wide for its driveability and riding comfort with rugged rough-road capability and utility with superior maneuverability. Subaru' s brand statement "Confidence in Motion" is the foundation of the brand' s automobile development. Subaru is committed to engineering excellence and "Enjoyment and Peace of Mind" and to create products in harmony with customer lifestyles and values. 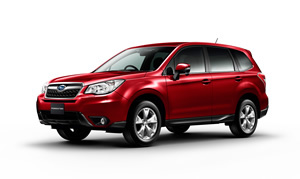 The new Forester is also a product embodying Subaru' s brand direction. A special site will open today at 11:00 am on the Subaru Global Site. The site will feature information updates of the new Forester and include a movie of the world premiere in Japan. Subaru defines the value of a true SUV as : providing user-friendly versatile utilities ; fun-to-drive character and ride comfort for long distances, even under harsh conditions; and stress-free driving. To realize this, both driving performance and ride quality were highly improved by adopting Subaru' s latest technologies together with the enhanced body rigidity. Excellent fuel efficiency and safety performance realize a "Peace of Mind" driving experience. Interior comfort and functionality have been further refined to provide a vehicle that is "fun-to-use" as an SUV. While maintaining a high-level of basic vehicle performance, a new AWD control system delivers not only "fun to drive" characteristics but comfortable and confident driving in all road conditions. Basic vehicle attributes such as "driving", "handling" and "stopping" have been refined. Vehicle stability, ride quality and low noise level have been further improved due to the vehicle' s enhanced body rigidity. Superior safety performance has been achieved in active, passive and pre-crash safety. Wide field of view for all seats and spacious visibility for stress-free driving have been achieved. Interior space with roominess ensures comfort for all passengers. Enlarged door openings provide improved ingress and egress. Utility of the cargo room has been improved for outdoor use. A powerlift tailgate*2 has been newly developed. By simply pushing the button, the tailgate can be opened and closed automatically. Driveability and fuel efficiency have been improved due to a new generation Boxer engine and a Lineartronic . Subaru' s own Horizontally-Opposed Direct Injection Turbo engine, combined with Lineartronic developed for higher torque, achieves environmental friendliness as well as high performance with smooth acceleration. The enhanced body and chassis have achieved stability and ride quality simultaneously under any road condition. The new AWD control system "X-MODE" delivers rough-road driving capability. The all-new Forester was designed with SUV-like powerful eye-catching looks while considering better aerodynamics and functionality. Front fascia expresses "Sportiness, Ruggedness, Peace of Mind and Confidence". The "2.0XT", direct injection turbo engine model, employs exclusive front design, accentuating its sportiness. By extending the bottom end of the A-pillar 200 mm forward than the previous model, an elegant form has been achieved. Designs of the front section, door panels and a rear gate express massive and powerful images. The wheel arch and wheel designs project a greater road presence and off-road capability. The interior design suggests spaciousness as well as boldness and provides a powerful look as a SUV, with a quality feel due to its sophisticated shape and soft touch materials. The instrument panel is styled to add to the spacious atmosphere. Soft touch materials enhance the feeling of quality in the cabin. The cabin design was carefully considered for greater comfort and utility for all passengers. Both roominess and a sense of openness have been achieved by redesigning the cabin , each pillar' s location and floor shape in the rear section. Seating positions were also totally reviewed to provide better visibility to all passengers, compared to the previous model. By enlarging the cargo space and rear gate opening, better utility of the cargo space has been achieved. A new "clean side sill" design protects passengers from dirt, when getting in and out of a car by keeping the sill clean. Wider door openings and lower side sills vastly improve ingress and egress of passengers. A multifunction display monitor shows details of the vehicle' s driving conditions to support fuel-efficient and safe driving. Sturdy and functional roof rails*3 are optional. Hill start assist function has also been adopted. When the vehicle stops on any hill, braking will be kept to maintain vehicle' s position temporarily as the driver takes off the brake. Due to this function, driver can easily start the vehicle on a slope. A powerlift tailgate*4 allows automatic opening and closing. The opening height of the tailgate can be adjusted so that the tailgate does not hit a garage ceiling, for example. Obstacles can also be detected during opening and closing. The layout of Subaru Symmetrical AWD system with low center of gravity and superior weight balance has embodied compliant ride quality in various road conditions. By combining the new generation Boxer engine with Lineartronic, both high engine output and good fuel efficiency have been achieved. Further increased rigidity of body and chassis provides comfortable driving with "Peace of Mind" for every driver. A new generation Boxer engine achieves both fast engine response and high fuel efficiency. Improved low to mid speed torque was adopted with a focus on manageability in practical use. Subaru' s own direct injection turbo technology was adopted for the new generation Boxer engine. By injecting fuel directly into cylinders, combustion efficiency was improved, resulting in both high engine output and fuel efficiency. By employing the newly developed twin scroll type turbo charger with superior response at low engine speed, high performance with high engine output*5 and torque*6 was achieved. It also has good environmental friendliness. Further advancing the benefits of Chain-driven CVT such as lightness, compactness, superior fuel efficiency and wide ratio coverage, Subaru has adopted a CVT with improved driveability and environmental friendliness by optimizing the parts and layouts. The new Lineartronic was applied for higher torque of the newly developed 2.0-liter Horizontally-Opposed direct injection turbo engine. Some parts such as the torque converter and chains were modified to endure high performance of the direct injection turbo engine. In pursuit of a linear response and secure driveability while absorbing any road surface irregularities, the rigidity of key points in chassis & body have been improved. Agile handling, comfortable driving and noise reduction have been achieved while body roll was minimized. The chassis was tuned exclusively for the turbo-charged model. Suspension rigidity was reinforced for better stability during high speed driving. Vehicle sway was minimized due to damper tuning and enlarged stabilizer diameter, turbo models offer superior stability when changing lanes and cornering. The new AWD control system "X-MODE" has been developed for the driving on uneven or slippery road condition. Engine, Transmission and VDC are controlled cooperatively. The system simulates various road conditions. By pushing "X-MODE" button, any driver can use the system easily and make the vehicle stable. SI-DRIVE which is effective for both driving pleasure and fuel-efficient driving was adopted. It has "Intelligent mode" and "Sports mode". *10 Driver can use either of them as the situation demands. The SI-DRIVE switch was equipped on the steering for easy operation. The "SI-DRIVE" was finely tuned for the models with DIT engine. It has "Intelligent mode", "Sports mode" and "S# (Sports sharp) mode". *11 In case of Sport# (S#) mode, the driver can shift between 8 steps. In addition to the smooth shift change of the CVT, the driver can enjoy sportier driving by selecting the mode with direct feeling like AT or MT vehicles. Subaru' s unique driving assist system "EyeSight (version II)" is available for both Turbo and Non-turbo models. By using high tensile steel effectively for the body structure, the body has been reduced in weight while attaining high rigidity. Superior crash safety performance has also been achieved. Adoption of the new generation Boxer engine and Lineartronic; enhanced aerodynamic performance; and Auto Start Stop system*12 improved fuel efficiency. A multifunction display monitor shows the condition of fuel consumption to support fuel-efficient driving. The fuel efficiency of the models equipped with the Lineartronic achieved the 2015 Japanese fuel standards.